OneSearch to bring them all and in the darkness refine them. We’re calling OneSearch the “digital front door” to the Smithsonian Libraries’ resources. 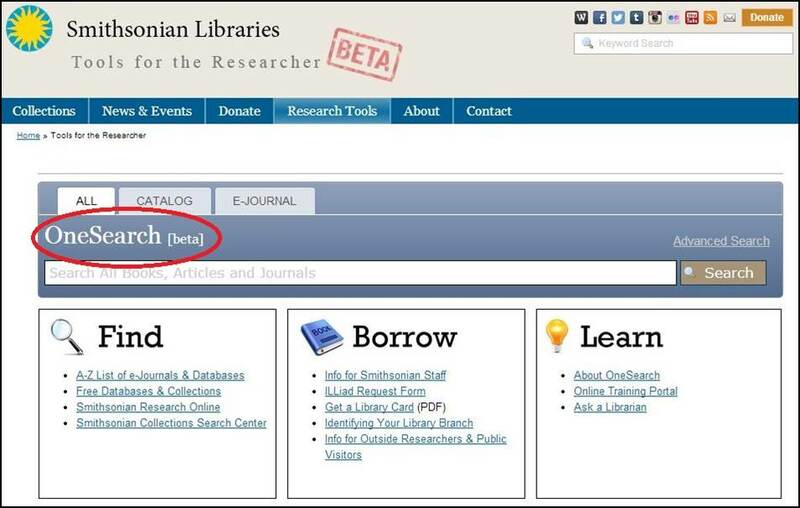 Found on our Tools for the Researcher webpage (shown below), OneSearch is a single search box that taps into a wide range of the Libraries’ research materials – the library catalog, journal and newspaper articles, databases, and much more. In fact, OneSearch has records for over 150 million items within the Libraries’ print and electronic collections! OneSearch also lets you broaden your search to include sources outside the Libraries’ collections with a single click, increasing that number to almost 1 billion records! 1. OneSearch finds reliable scholarly information. While general search engines like Google are good for everyday searching, they can be frustrating when you’re trying to do scholarly or advanced research. The massive results you get using a general Internet search engine can be overwhelming and often not relevant, and you can’t trust that all of the information you find is reliable. After all, anyone can set up a website and put anything they want on it. With OneSearch, you’re searching only resources identified as appropriate for researchers, not the entire Internet. So your search results are focused on scholarly content that is much more trustworthy. 2. OneSearch offers useful ways to narrow your search results. It’s easy to use Google’s single search box, but it doesn’t offer many options to help refine or narrow down the long list of search results you get. Most general search engines offer an Advanced Search (you can see Google’s here), but they don’t make those easy to find, and I don’t think their narrowing options are that helpful. OneSearch offers you the best of both worlds – a single search box AND easy-to-use tools to narrow your results. 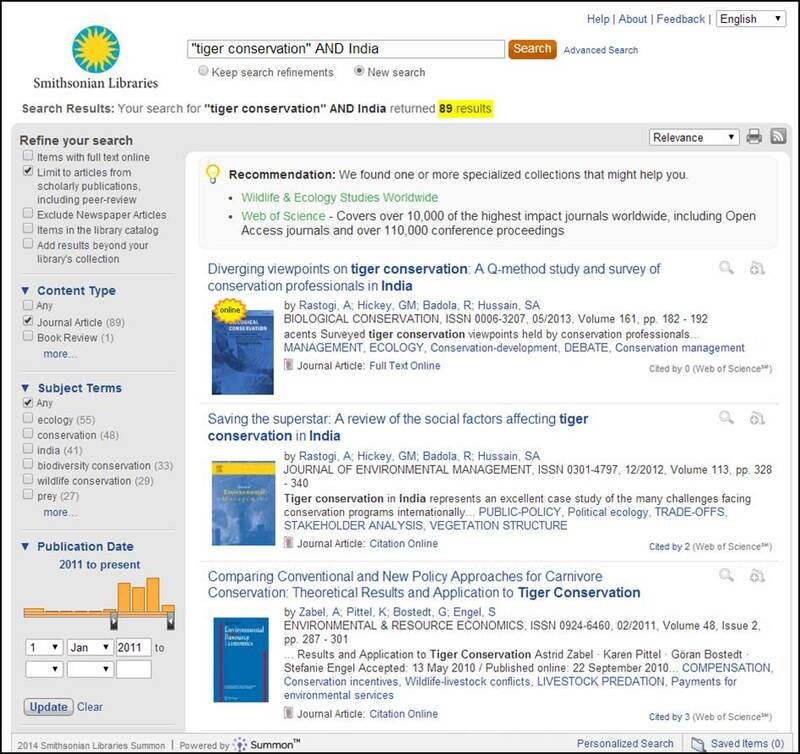 In the search example pictured below, I’m looking for recently published research on efforts to save tigers in India. 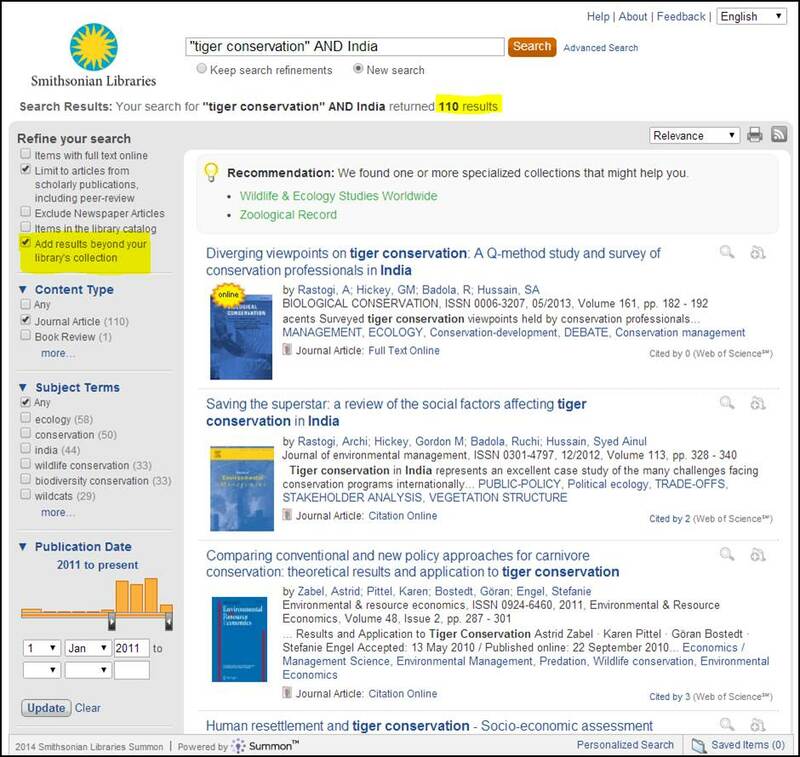 So I entered the following into the OneSearch box: “tiger conservation” AND India. (By putting quote marks around a phrase like “tiger conservation”, I’m searching for that exact phrase. You can find more search tips like this in one of my previous posts.) On the OneSearch results page, there are handy checkboxes and a date slider on the left side to refine my search. I narrowed by checking the boxes for scholarly publications, journal articles, and setting a publication date limit of 2011 to the present – which gives me a good results list of 89 articles that really look relevant for my research. When I tried using the same search words in Google, I got about 170,000 results, with no easy way to narrow that down. And many of those hits were general information websites, not focused on scholarly research. 3. OneSearch also uncovers information from scholarly resources beyond the Smithsonian Libraries’ collection. To find even more in OneSearch, there’s a very useful checkbox on the left side of the results list – “Add results beyond your library’s collection.” (It’s highlighted in yellow below.) You’ll see that marking this checkbox for my sample search expanded my results list from 89 to 110 results – and it’s still focused on scholarly journal articles from 2011 to the present, like I wanted. These new records that I’ve uncovered may be from databases, catalogs or other resources that the Smithsonian Libraries does not have but that are part of the larger OneSearch system, which brings together scholarly information from a variety of other libraries, publishers and information vendors. So this expanded search is still showing me research-worthy materials, not the jumbled list of websites a general Google search would likely produce. One very important note: You may notice in the first article record above a link for “Full Text Online.” And you may be thinking, “Wow, I’ll be able to see this full article if I click that link!” Unfortunately, that might not be the case. Most of OneSearch‘s full text online access is limited to researchers connected to the Smithsonian computer network. This is due to licensing restrictions for the research databases for which the Smithsonian Libraries has paid subscriptions. But some of the “Full Text Online” links may lead to free online journals or resources, so go ahead and try the link! If you find a record for something that isn’t available free online, I would suggest contacting your local public or academic library to see if they provide access to the material. Many academic libraries have extensive print and electronic resources available, and some are open to public visitors, particularly state university libraries. If you are in the Washington, DC area or planning to visit, you are welcome to schedule a research appointment at the Smithsonian Libraries. You can learn more about this on our Visiting the Libraries webpage. So go ahead and take our new OneSearch for a spin! We hope that you’ll think it “rules them all” too. Looking for my mother, Kay Barkley’s book at the Smithonian named, “The History of the Ambulance”?